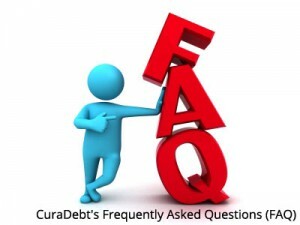 The following are some of CuraDebt’s frequently asked questions (FAQ) that may be helpful to you. If you have questions that are not listed below, please give us a call at 1-877-850-3328 or email the counseling department at counselors@curadebt.com. Debt relief refers to resolving your debt without taking out a new loan. The CuraDebt in-house debt relief program is designed to help you save as much money as possible, as quickly as possible, based on the money you have available. It puts you back in the driver’s seat to get you the maximum savings on your debt. You may have your own unique situation. You may be experiencing a hardship or challenge. You may be making minimum payments and not getting ahead. You may have realized that you will be paying your debts many times over and be enslaved to the creditors. If you are in this type of situation, and looking for a better solution, then a debt relief program may be the right option for you. You may have tax debt issues and need an immediate solution. Tax debt relief is structured differently than unsecured credit card relief. At the same time, the goal is the same: get a solution in place for the issue that completely resolves it. What Debt Relief Option For Unsecured Debts Does CuraDebt Provide? CuraDebt offers an in-house debt relief program where we only earn our fees based on results of the program. The way this program works is that money will accumulate on a monthly basis in a special purpose account. Alternatively, you may have a lump sum amount that will accelerate the program. Based on the amount of money accumulated, CuraDebt will negotiate the best possible reductions for your debt. Each account is negotiated and resolved until all of them are settled. The results of a debt negotiation program are based on a number of factors such as the age of the debt, who the creditors are, what type of debt you have, what state you live in, your age, your credit history, your assets, your financial profile, and many other factors. CuraDebt has been helping people in the industry for over 16 years and is one of the oldest and most experienced debt relief companies in the nation. This means that CuraDebt is likely to get the best possible results for you. So if you are considering your debt relief options, and do not want to take out more loans, then speak with a CuraDebt counselor to get more information on how to get started. Unsecured debt refers to loans which are not tied to physical property. Examples of unsecured debt include credit cards, medical debt, department store cards, signature loans, unsecured lines of credit, payday loans, personal loans, revolving charge accounts, collections debt, repossessions and certain business debts. Secure debts are tied to a physical property. For example, your home loan is secured against the home. If you do not make payments towards the home loan, the lender will foreclose on your home to ultimately take it. As another example, your auto loan is secured by the vehicle. The same applies to all types of loans that are secured by real property. This is why you need to keep paying your secured loans. In a debt relief program, only unsecured debt can be included. Creditors are unable to take or repossesss anything against these loans and this allows for the best possible reductions on the balances. Does CuraDebt Help With IRS And State Tax Problems? Through� CuraDebt Tax, solutions can be found for tax related problems such as tax liens, wage garnishments, delinquent payroll tax issues, and other tax related problems. In some cases just by getting proper tax returns filed, a significant adjustment in the amount of taxes owed is realized. Contact one of our Tax Account Executives on 1-877-999-0486 Toll-Free for more information. Is CuraDebt A Member Of The American Fair Credit Council (AFCC)? CuraDebt is a member in good standing with the AFCC, the largest and oldest association for debt relief companies. In order to be a member of AFCC, a debt relief company has to comply with a stringent set of requirements and disclosures and maintain these standards in order to keep up with renewals. You can rest assured that CuraDebt aims to achieve the highest level of service and standards for our clients. We believe that all companies that are operating legitimately and with the consumers’ best interests at heart should be members of the AFCC. Will A Debt Relief Strategy Work For Me? As an alternative to bankruptcy, a debt relief strategy is the best and fastest way to get out of debt. However, there are conditions that must be taken into account for the program to work. The most important factor that determines the success of a debt relief program is the individual’s ability to fulfill their payment obligations on a monthly basis for the duration of the program. A number of factors influence the cost of entering a debt relief program such as the creditors you owe, your credit balances, your ability to contribute monthly dedicated account payments into the program, the amount that can be negotiated from your balance, how quickly it is negotiated, and the fees charges. CuraDebt fees, on average, are 20% of the total debt amount enrolled and are calculated as part of your monthly repayment. There are no upfront fees to be enrolled in the CuraDebt debt relief program. The goal of the debt relief program is to help save you as much money as possible, as fast as possible. Our focus is to help you save as much money as possible, as soon as possible. Your focus should be on your job or business and family. It’s hard enough having to manage everything going on around you and still have to worry about your debt. CuraDebt has professional, trained staff to provide you with the best way forward. While you ensure that you make your payments monthly, which may account for 2% of the effort, CuraDebt is working tirelessly to ensure that the other 98% of the process is in place and managed to help you save money and be debt free as quickly and painlessly as possible. Loans such as federal student loans, certain credit union accounts, and government loans are not eligible to be included in a debt relief program. Any loan that is tied to a physical item, such as auto or mortgage cannot be included. Private student loans, that are not government backed, may be included in a debt relief program. Please call 1-877-850-3328 to get more information and see if you qualify for our debt relief program. Is CuraDebt Licensed And Bonded? CuraDebt is licensed and/or bonded in numerous states. CuraDebt is in full compliance with federal and state laws, as well as meeting any licensing and bonding requirements as needed by each state where it provides services. What Are My Responsibilities Once I Enroll In The CuraDebt Debt Relief Program? Once you are enrolled in a debt relief program, your responsibilities will include keeping up a great line of communication and making payments on a monthly basis into a special purpose account. CuraDebt will handle the rest of the process and make sure that you save you as much money as possible, as fast as possible for as long as you are in the program. Can I Come In For A Face-To-Face Counseling Session? Absolutely. Please call 1-877-850-3328 to schedule a consultation on a first-call, first-scheduled basis in the Hollywood, Florida office.